DON'T BE A B.R.A.T., BACK V.A.T.! Any self-respecting fan of fictional sixties spy trivia knows that U.N.C.L.E. stood for "United Network Command for Law and Enforcement" and that S.H.I.E.L.D. was an acronym for "Supreme Headquarters International Espionage Law-Enforcement Division," right? But I'll bet a sock full of nickels that, no matter how deep into fantasy espionage you were, you don't have a clue what V.A.T. stood for. It can now be revealed--since it never was in a single JOE AGENT OF V.A.T. episode--that V.A.T. stood for "Victor's Action Team." 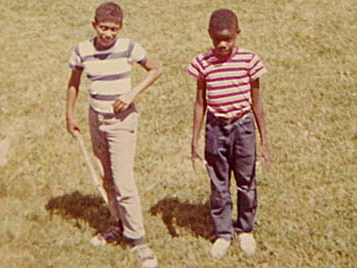 That's Victor as in my childhood buddy, Victor Harris, who (very briefly) "led" a juvenile organization of that name circa 1967-68. The titular character in the show was based on another childhood pal, Joe Ryan, who went to St. Hilda's and St. Hugh's with Soter and myself for a spell. (Oddly, neither Joe Ryan nor Victor Harris had any idea that Tom Soter and I were using their personas thusly). The real Joe Ryan (right) with "Corp. Idiot" (Tom Sinclair), c. 1966. While the show's debt to Nick Fury was obvious, it also owed a great deal to GET SMART and the whole school of spoofy-spies (Matt Helm, Derek Flint. et al). "D.U.M.B./Everyone's accusing me," the Ramones once quipped, and that could have been JOE's manifesto. Never mind Corporal Idiot-- every character on JOE, from the heroes to the villains, was a world-class bumbler, short several pounds of brains. I especially enjoyed the irredeemably bad bad guys: The Mad German, Speedman, Beaman, assorted agents of B.R.A.T. (what the hell did that stand for, anyway? ), and the endless parade of "commies," who would chortle and say things like, "We are so evil, heh heh heh." Incidentally, the theme song, "Secret Agent Man," was recorded specifically for the show by the great Johnny Rivers (although we let some TV types use it in a little program called SECRET AGENT starring Patrick McGoohan). 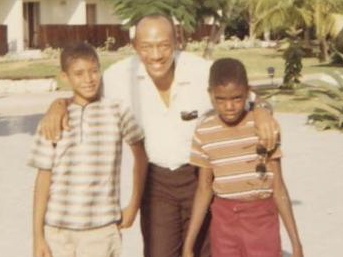 The Friendly Encounter: Siny (left) and Joe with Jesse Owens. There was a comforting predictability to JOE. Every episode was called "The Deadly (Fill in the Blank)," and every one ended with the cast guffawing over some painfully bad joke. It really was nowhere near as funny as GET SMART, mind you. ("Missed it by THAT MUCH," I can envision some wiseacre saying, spreading his hands wide to measure the qualitative chasm between the two programs). But, in its own way, JOE was--well, a hell of a show. After the above was written, the real Joe Ryan finally met his fictional counterpart. In an e-mail to Tom Soter, Joe wrote: "I'm floored and really happy to see you guys together after all these years. I stumbled on this site and am glad to see I wasn't the only one brain-twisted by St. Hilda's... (signed) Joe Ryan (yeah, that one!)" Introducing rough, tough Joe Ryan, ex-C.I.A. agent, who is recruited by a mysterious organization known only as V.A.T. Joe: Tom Soter. Corp: Tom Sinclair. The commies plan to infect Joe with a virus that will make him evil. Joe: Tom Soter. Chief: Harry Smith. Joe and his colleagues encounter the Mad German, a nefarious ex-Nazi with plans to conquer the world. Joe: Tom Soter. Corp: Tom Sinclair. Mad German: Ron Nielsen. Agent Wade Wise’s Potato Chip Gun plays a crucial role in this episode directed by Tom Soter (Joe), which finds the agents cornered by the Mad German and Dr. Evil. Wade: Alan Saly. Corp: Tom Sinclair. Joe investigates why the loyal VAT workers are loyal no more – they’re rioting. Joe’s dangerous plan: convince the rioters that he is one of them. Joe: Tom Soter. Joe faces Black Gumby, a foe who has the power to impersonate anyone, including Joe (Tom Soter). Corp: Tom Sinclair. Chief: Harry Smith. Joe receives a birthday cake in the mail – even though it isn’t his birthday. Joe: Tom Soter. Chief: Harry Smith. Wade Wise: Harry Fredericks and Phil Sloan. The commies plan to strap the Chief (Harry Smith) to a rocket and shoot it to the moon. Joe: Tom Soter. Corp: Tom Sinclair.